Singapore being a hot and tropical country, it is of no wonder that the climate is hot and humid all through the year. Air conditioners are not a luxury in Singapore but a necessity. A peaceful night or a relaxed day is almost impossible without aircon. The more they work, the more is the maintenance and servicing needed. If serviced properly and maintained regularly, the lifespan and the functioning of aircon is surely increased. What are the 7 important tips for aircon servicing? Some people are of the opinion that it is the exterior part that gets dusty. They feel the outer part should be cleaned well. Others feel that it is the interior part that needs regular care and service. Which is right? Both are wrong. The right thing to do is to clean the inside as well as outside part thoroughly. Dip a sponge in a mild detergent solution to clean the parts and then wipe it dry with a soft cloth. The chances of the filter getting clogged are very high in Singapore. The filter should be cleaned with a fine soft brush using a soap solution at least once a month. It should be wiped and left to dry in the open for a few minutes. Make sure that the filter is put back in its place only after it dries up. Filters need to be replaced periodically for the efficient functioning of aircon. This is an important step in aircon servicing because the evaporator tends to become the breeding place of microorganisms like bacteria, virus and fungus. This can affect the health of the whole family. The evaporator unit must be first removed with a screw driver. The underside of the evaporator should be cleaned well. You can use a mild disinfectant or bleach to clean the evaporator. This can prevent the microorganisms from thriving and multiplying. There is a tray below the evaporator. This too should be cleaned. Fix the evaporator unit back in its place. Tighten the screws and seal the unit securely with a broad tape. The condenser is one of the parts located in the outer part of the aircon. There should be no dust in the condenser. This can obstruct the air flow. Sometimes the moisture content in the air may promote the growth of small plants near it. Check the area around the condenser at least once in two months to make sure that nothing grows in that area. Take a lot of care while cleaning the condenser because rough handling can result in breakage. 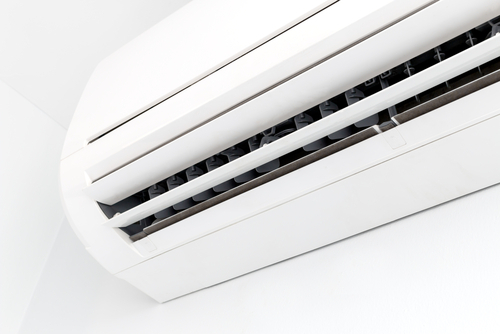 Dust seems to accumulate easily in the fan and the compressor of your aircon. They should be cleaned with care. First use the blower of the vacuum cleaner to blow away the dust from them. Then use a soft wet cloth and wipe them. If you leave it wet it may attract more dust. Use a dry cloth and wipe it dry. Make sure that all screws are tight. If there are any loose screws tighten them using the right screw driver. Proper maintenance of motor ensures soft and noiseless running of your aircon. If your motor is not properly maintained and are not replaced when necessary, you cannot dream of having a good sleep because your aircon becomes too noisy. Be careful in cleaning the motor. Refer to the instruction manual for cleaning tips before starting to clean the motor. You should follow an important precaution because safety is the primary requirement. Your aircon unit should be turned off. It is better to have it unplugged to make sure that there is no power supply to the unit. This is very important tip for your aircon servicing. This is the very first step and don’t ignore it. Better to be cautious than to regret later. Aircon servicing in Singapore needs to be done regularly. If you maintain and service your aircon once a month or once In two months you are assured of the best performance. Enjoy the coolness in your home and get relief from stress. It is true that not all people in Singapore can find time to service their aircon regularly. If you are too busy, you can get the services of a reputed aircon servicing company to do it for you.